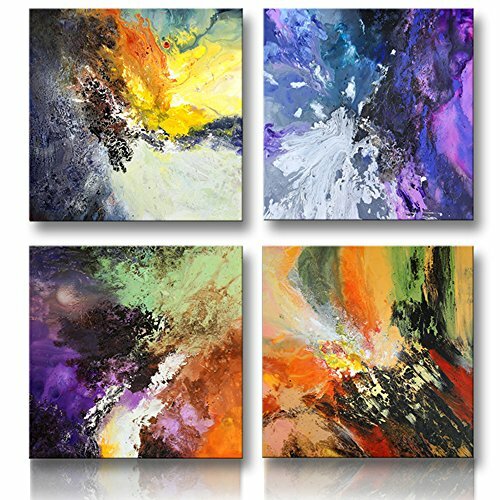 This Abstract Painting Canvas print art is printed on canvas in High Resolution, gallery wrapped on wooden stretchers, with extra mirrored border. Ready to hang! Each piece is installed with a hook, so easy hanging! Each piece is protected with a plastic bag, and the whole set put into a solid carton box. Perfect Wall Art forDecoration, such as for: Living Room, Kitchen, Bedroom, Dinning Room, Reading Room, Children's room, Hallway, Offices, Coffee House, Hotels, ect. A Great Gift for friends, relatives. Please note that display pictures are only for illustration purposes. They were not taken in real display rooms and do not represent the real size of the print set. 2.Gallery Wrapped Abstract Painting with stretcher, Ready to Hang! 4. Already mounted with Hook, and nails in a bag, it is so easy hanging! If you have any questions about this product by SUNRISE ART, contact us by completing and submitting the form below. If you are looking for a specif part number, please include it with your message.